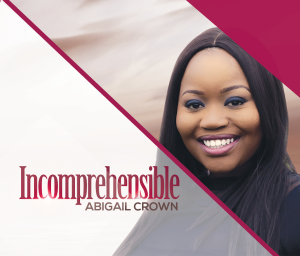 The songs on the INCOMPREHENSIBLE album are a selection of songs that express some of my revelations of who God is. I've experienced him to be the God who loves unfailingly, the God who has a plan for me in His will, the God who came to give me salvation, the God who reigns and is exalted and so much more. The purpose of this album is to let people know that God is incomprehensible. You may have known him to be your healer and provider, but God can be so much more to you. He longs to reveal himself to us in a new way everyday.